I am so excited to show you this office we just finished. The client had great built-ins at the top of her landing. She came to me because she wanted to add some personality... so we did! This desk area serves as a work space for this busy mom of two girls and a homework nook for her little ones. She told us that she wanted it to be soft, but still have lots of personality. It is sometimes difficult to pull off "fun" and with neutrals and soothing colors. Originally, the walls were a pale blue and while pretty, they had so much more potential! We wallpapered the space in a Nina Campbell paper that easily flows off the other rooms in her house. Pulling the green from the paper made the bookcases pop and calls attention to fun accessories. We filled the bookcases with pretty boxes for storage, pretty covered notebooks and lucite bins packed with supplies. We accented the area with lighting and bright accessories to play off of the wallpaper. Brightly colored art pulls out the blues from the wall across the way and the peach and green color palate of the wall covering. A neutral hide rug adds texture to the carpet and grounds the landing as it's own space at the top of the stairwell. Pretty collectables pull sweet tones of lilac and green out of the walls. Painting the built-ins in a glossy green bounces light around the space. Her somewhat blank wall opposite the desk area called for more art and family photos. What a great place to show off her beautiful girls. The gallery wall adds dimension and interest which is a nice balance with the wallpaper. Last but not least, the old lighting was removed and we replaced it with a sputnik chandelier. Remember the CraigsList post from last week? Turns out, good research leads to killer finds. Let's suffice it to say that my husband was not thrilled to have to stop in Charleston on a way to a business meeting to take this chandelier out of my new CraigsList friend's ceiling. We loved how it turned out and so do the girls. Now our happy client has both function and fun all in one space. On a serious note, our thoughts and prayers are with all of the men, women and families who lost loved ones twelve years ago today. May God bless all that were affected by this tragedy and this great country we are fortunate to call home. 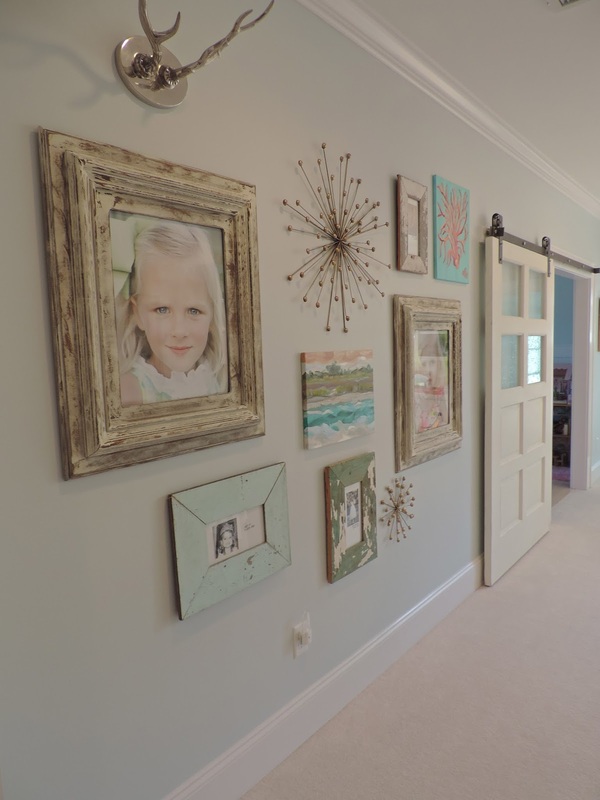 I would love to know where you got that great collection of frames for your gallery wall, please! Thank you! !